For Pacific island nations and her people, the evolving climatic realities now heavily influenced by a much warmer planet than we found it, is a stark reminder that at the end of the day, the human race shares one earth. As the impact of global warming changes climatic systems to the point where some traditional knowledge has been nullified, and as the tentacles of its impact touch our food sources and force us to plan for complete inundation, the interconnectedness of our biosphere cannot be overemphasized, and the fact that causality does not have to be local, emphatically underlined. Another crisis that humanity has to grapple with at an international level which has been brought to the fore of late, particularly during the 71st Session of the United Nations this week, is the issue of refugees and migration. Just as exemplified by the interconnectedness of the natural system about 7.5 billion of us are having to survive in, the links between sustainable development, peace and security and the realisation of basic human rights for all people are as inextricably linked. Indeed the need to implement development activities in an integrated manner, where we take advantage of our collective resources rather than compete for what remains in the shrinking baskets of traditional donors and philanthropists has never been so critical, particularly in our ocean of islands where transportation costs alone are crippling. There are an estimated 244 million international migrants in the world today. The United Nations Refugee Agency estimates 65.3 million displaced people, the largest number since World War II and today, refugees are forced to be away from their home for an average of 20 years. Global leaders made a historic agreement this week at the first ever Summit on Refugees and Migrants in recognition of the millions who have been forced out of their homes for whatever reason. The New York Declaration "rallies all partners around collective commitments to protect the human rights of all refugees and migrants". The New York Declaration commits world leaders to protect the human rights of all refugees and migrants, regardless of their status, including those who are most vulnerable: women and girls. The declaration additionally calls for preventing and responding to gender-based violence and working to end the xenophobia targeted at so many refugees and migrants. United Nations Population Fund (UNFPA) executive director Dr Babatunde Osotimehin advocated for investment in young people to ensure a future for them at the summit, "whether that future is at home or abroad". Summit participants agreed young people's rights and opportunities needed to be assured within their own countries. President of the 71st UNGA, Fiji's Ambassador Peter Thomson lamented the lack of empathy towards those caught in this mass movement of people. "I regret the evidence of widespread lack of empathy for people on the move, many of whom are fleeing from conflict, persecution or climate change," Mr Thomson said. "It is time to turn down the rhetoric of intolerance and ratchet up a collective response based on our common humanity." While we are already seeing the impact of the refugee and migrant crisis in our back yard, Mr Thomson alluded to why it is an issue which must be in our social, cultural and economic considerations. Climate change will create a similar movement of people within our ocean of islands and we will have to be prepared. 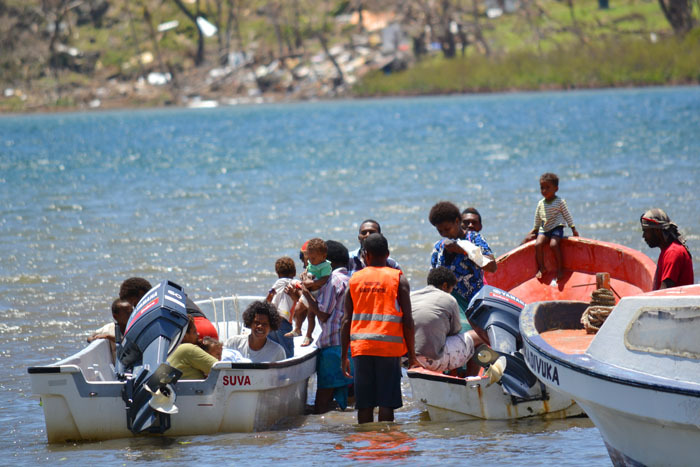 Fiji has been hard at work in the past three months responding to the devastation caused by Severe Tropical Cyclone Winston, the largest tropical cyclone to make landfall in the Southern Hemisphere. The region can expect more such phenomenon with increased intensity. Chairing a high-level meeting on movement of refugees and migrants three days ago (September 20), Fiji's Prime Minister Voreqe Bainimarama said: "As time goes by, we are also bound to see greater movements of refugees and migrants triggered by climate change â€¦ (the) issue of climate change displacing large numbers of people is of particular concern to Fiji." The UNFPA State of World Population 2015 report entitled Shelter from the Storm: A Transformative agenda for women and girls in a crisis-prone world provides that more than 100 million people are in need of humanitarian assistance; one quarter of which are women and girls, between 15 and 49 years old (child-bearing age). The special needs of women and adolescent girls must not be sidelined in our considerations of this refugee and migrant issue. It is imperative that every displaced women and girl's health and dignity are protected - because it saves lives. As we scramble to do what we can collectively to address the refugee and migrant global crisis, let us not forget that displaced women and girls are also at heightened risk of sexually-transmitted infections including HIV, unintended or unwanted pregnancies, maternal death and illness and sexual and gender-based violence. Any response to the impact of mass movements of people must firmly have at its core action that addresses the unique needs of women and girls in such fragile settings. Women and girls comprise half our populations; if the needs of half of our population are not addressed with sincerity and thus effectively, it will literally be a drag to any hopes of collective progress. Our interconnectedness demands nothing less.